This blog entry is composed from the beautiful harbour of Eyemouth which has everything one could possibly want. Quaint shops, photogenic harbour, working fishing boats that don't spill diesel all over you, mains electricity, and a performing seal in the harbour that begs for fish. Very cool, except for no phone signal at all and no wifi. In writing this blog I feel a little like an Arctic explorer who writes his message but does not know if it will get through. Today was a fantastic day. We left Port Edgar near Edinburgh after a very swelly night where I was concerned that we might sustain pontoon damage, but in the event no damage was sustained following the deployment if a few inelegant but effective warps. 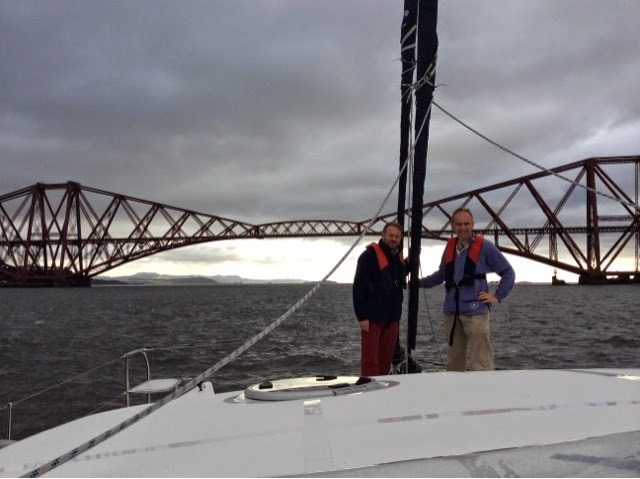 We departed at 0800, passing under the Forth bridge with its 5 million rivets holding it together, (photo of Matthew and Mark attached) as planned and immediately took advantage of the tide with us and the fresh WSW wind behind us. We sailed the entire day, a short one at 52nm, and passed out of the Forth earlier than expected as our speed increased, as did the wind. By the time we were out of the Forth, we had a sustained 27 knot wind and reefed the full gennaker, then reefed the main sail. Alexandria loves to surf and by the time we reached Bass rock with its huge population of sea birds, we were surfing at around 12 knots, before a rather swelly wave pattern. Wind gusts if up to 34 knots made for a focused sail! We reached Eyemouth at 1500, which was very good going indeed, and were directed to moor against an old and beautiful Dutch yacht called 'Swaen' Nice people on board who did not seem overly concerned with us rafting up against them for the night. A short period of congratulation on our passage and a glass of something chilled, and we then ate in a super restaurant in Eyemouth. Tomorrow we intend to travel southward to Lindisfarne, which is just over the border in England, then anchor, and afterwards continue onto Amble where Ian and Jonty arrive to meet us, and sadly Matthew and Mark W depart early the next morning. We are all rather tired as the day has been very full on, though very enjoyable. I hope the blog gets through.